Take a really good look at the passionate fellow with the crazed look in his eyes in the picture above. You are looking at one of the most amazing figures of the LDS foundation movement. He was nick-named the Wild Ram of the Mountains and has been characterized by some as the most loyal friend Joseph Smith ever had. In section 101 he was given the cryptic name of Baneemy, which refers to a military office. He was ordained to that office by Joseph Smith in the presence of an angel. This world has not seen the last of this guy. The Lord has promised he is coming back. He is going to be an integral part of a military strike that will turn this world upside down. One of the things I have tried to do in a few of the articles I have written about the LDS foundation movement is to briefly spotlight from time to time some of the remarkable disciples of Christ that have played an incredible role in building up of the kingdom in the 2nd watch and will continue to play a significant role in the 3rd watch. As great as the Seer, Joseph Smith was, he was not the only one with special gifts nor was he the only one with a special calling. And he certainly wasn’t the only one who sacrificed greatly for the cause of the kingdom. The Lord prepared and provided many souls who all played and will play very important roles in the ushering in of the kingdom of God on earth. The prophet leaned very heavily on many of the special souls who were drawn to the movement. Unfortunately the succession issue created a huge bias in the minds of many against everyone that did not submit to Brigham Young and those members of the quorum that united together after the martyrdom. The sanitized history of the Church is pretty much calculated to destroy the credibility of those individuals as well as to imply that Joseph Smith was in a class of his own until he died and the Twelve took over.. In the four part series I did on Rigdon, I attempted to show that Joseph did not single handedly restore the church and roll forth the kingdom of God under the direction of the Lord, many people in fact played a very significant roles, and brought much to the table when they joined the church. The congregations Rigdon prepared for the restoration played an important role. It seems like the “whose who” of Mormonism mostly came from the congregations that Sidney prepared, including this fellow I am spotlighting today. Sidney’s knowledge of the Bible, his leadership skills and the lineage related right to the priesthood that brought with him were a formidable part of the preparatory work that took place in the 1800’s. has an incredible support and in many ways a mentor to Joseph Smith. Modern revelation actually speaks more about Sidneys calling than it does Josephs. Oliver Cowdery is another huge player in the past and future development of the Marvelous Work. I have not done justice to him in my writings. He was the one who knelt beside Joseph when receiving priesthood authority and keys from John the Baptist and Peter James and John. He was designated the “Second Elder” and “co-President” of the Church when it was restored. He gave Joseph Smith a patriarchal blessing that will go down in history as one of the most revelatory descriptions of Josephs calling. He was the one who was jointly given dispensational keys of the priesthood in the Kirtland Temple and he authored the original section on marriage and also section 20 which was known as the articles and commandments of the church. It is arguably one of the most important sections pertaining to the development and growth of the church in the early days of the movement. People like Hyrum Smith, David Whitmer, Edward Partridge, Newel K. Whitney, Thomas B. Marsh, David W. Patten, William Marks, George Miller .. and many others played huge roles in the restoration of the Church and many of their contributions and sacrifices have largely gone unnoticed. Particularly those who chose not to follow Brigham and the Twelve. Today however, I am going to highlight a few things about the guy in the picture above. If I were to list, in my humble opinion, the ten most Godly, influential leaders of the LDS foundation movement of the 1800’s that had the greatest impact on the church from 1830 to 1844, this guy would be on the list. In fact, he might just make it into the top five. In section 101 which, in it’s first printing replaced the names of people with cryptic names, he was referred to as “Baneemy”. If someone were to ask you who Lyman Wight was, what would be your response? Can you think of three major events in LDS church history that he played a major role in? Who was the first person in this dispensation to be ordained to the Melchizedek Priesthood and then have the heavens open and see the Son of Man sitting on the right hand of the Father? Who was the person that ordained Joseph Smith, Sidney Rigdon and 16 others to the Melchizedek priesthood? Who is the person, identified by revelation, that will accompany Joseph Smith in gathering the strength of God’s House and leading the army of the Lord to tear down the tower of the enemy and redeem Zion? Who built the first temple in Texas? Two years ago Mrs Watcher and I and Mr. and Mrs. Malachi went on a pilgrimage to Kirtland Ohio and Nauvoo Illinois. While taking a tour of the Isaac Morley farm and hearing the incredible circumstances surrounding the first bestowal of the High Priesthood in the latter days that took place during the special conference held during June 3-6 1831, one of the tour guides mentioned that he and several others had in their possession, a listing of the brethren that were given the high priesthood on that occasion. I got the impression that the listing was put together by an LDS author in the area who has written extensively about the events that took place in and around Kirtland Ohio. He was kind enough to provide me with the “secret list”. Within the listing, a brief summary of what happened to each of them during their lives was provided along with a “grade” as to how “valiant” they had been in their testimonies and to the priesthood they had been given.. I was frankly taken back a little bit by the blatant judgment of these souls that was taking place. Each soul was designated as either an “F” for “Faithful” or an “A” for “Apostate”. The apostates were then catagorized into one of three groups depending on how great their light was and how far they fell from it. Everyone who had rejected the leadership of Brigham Young was in one of the three apostate categories. The purpose of this post is to give you a brief history of the life and service of Lyman Wight and the role he has played thus far in the great work of the Lord in the latter days. Most of the content below has simply been cut and pasted from other websites. It is not necessarily all in chronological order. I have provided links to them at the end of the post. Lyman Wight was born in Fairfield, New York. He fought in the War of 1812. He united with Isaac Morley and others in forming a common stock utopian society in Kirtland, Ohio. The four Mormon missionaries from New York could hardly have hoped for a more receptive audience than Sidney Rigdon’s congregation at Kirtland, Ohio. Hoping for a return to biblical Christianity, they had already formed themselves into a common-stock “Family” patterned along New Testament lines and responded enthusiastically to the missionaries’ proclamation of the restoration of Christ’s true church on earth. Sidney and many of his followers, [including Lyman Wight] were soon baptized. [Lyman] was baptized by Oliver Cowdery in 1830. He was ordained a high priest in June 1831. Among the sixteen others Lyman “ordained to the high Priesthood” were Joseph Smith, Sr., Parley P. Pratt (h), Thomas B. Marsh (h), Edward Partridge, Martin Harris, and John Whitmer. “The spirit of the Lord fell upon Joseph in an unusual manner… After he had prophesied he laid his hands upon Lyman Wight [and ordained him] to the High Priesthood after the holy order of God… and the spirit fell upon Lyman, and he prophesied, concerning the coming of Christ. He said the coming of the Savior should be like the sun rising in the east and will cover the whole earth So with the coming of the Son of Man yea he will appear in His brightness and consume all the wicked before him and the hills will be laid low and the valleys be exalted and the crooked be made straight and the rough smooth. And some of my brethren shall suffer martyrdom for the sake of the religion of Jesus Christ and seal their testimony of Jesus with their blood. The following day the prophet received a revelation calling Lyman Wight and many others to move to Missouri. Lyman was warned that “Satan desireth to sift him as chaff” but was also promised, “he that is faithful shall be made ruler over many things” (D&C 52:7, 11-12 it is interesting to note that the warning given to Lyman was the same warning Christ gave to Peter!). Lyman left almost immediately; Harriet and their three children joined him in September. [During this mission] he built up a branch of more than one hundred Saints, many of whom returned to Missouri with him. On arriving in that city he called at a hotel and engaged his board for several weeks. The landlord asked him what his business was. He replied he was a preacher of the gospel after the order of Melchizedek. He created so much curiosity that they wished to hear him preach. He told them that was his business, and if they would open the court house he would do so willingly. They obtained the house, and he delivered a series of lectures and built up a branch of the Church, and baptized upwards of one hundred. The family of Higbees were among the first baptized; they were fishermen, and Wight would fish with them through the day and preach at night. One evening he went from the fish net to the court house, and stood on the top of a stove barefooted with his trousers, rolled up to his knees, and his shirt sleeves up to his elbows, and preached two hours. Some of the people remarked, “He preaches the truth, though he does not look much like a preacher.” Many that he baptized went to Jackson county, Missouri, and were with him through the persecutions of 1833. During that persecution he was a dread to his enemies and a terror to evil doers, and his life was often sought after. He commanded the brethren in Jackson county in their defense against the mob. In one instance he was chased by seven men about six miles; they were fully armed and came upon him so suddenly that he had to mount his horse with a blind bridle, without any saddle or arms, except a pocket knife. His horse being fleet, he escaped by out-running them and leaping a deep wide ditch, where none of his pursuers dared to follow. On July 3, 1834, he was ordained one of the High Council of Missouri. After the Saints were driven out of Jackson county into Clay county, volunteers were called for to go and visit the Prophet at Kirtland. Several of the Elders were asked by Bishop Edward Partridge if they could go; but they made excuses. Lyman Wight then stepped forward, and said he could go as well as not. The Bishop asked him what situation his family was in. He replied, his wife lay by the side of a log in the woods, with a child three days old, and he had three days’ provision on hand; so he thought he could go very well. Parley P. Pratt next volunteered, and they went together to Kirtland in February, 1834. He arrived in Kirtland, Ohio on February 22, 1834. Two days later he and Pratt testified about the conflict in Missouri to the newly formed high council. This led to the organization of Zion’s Camp. Joseph sent out men two-by-two to recruit volunteers. Lyman left on April 21 with Hyrum Smith to recruit from the northwest. Recruitment was difficult, as many people did not want to leave their homes to defend someone else’s. Hyrum and Lyman recruited about twenty individuals, including Hosea Stout, who was not a member but was impressed with their preaching. They met with the main company on June 8 at the Salt River in Missouri, bringing the total to 207 men, 11 women, 11 children, and 25 wagons. Lyman tolerated the conditions of the rest of the company including the eating of moldy and rancid food, under the promises from Joseph Smith that they would not be afflicted by it. After a 900 mile march, the members of the camp reached Missouri where they were smitten with cholera. They were then discharged without having accomplished their goal of returning the Latter Day Saints to Jackson County. At the end of Zion’s Camp, Lyman Wight wrote up the discharge orders, and remained in Missouri according to Joseph’s command. He [later] opposed the selling of land in Jackson county, Mo., and considered Wm. W. Phelps and John Whitmer in transgression for selling theirs. The original 1835 edition of the Doctrine and Covenants, a book of LDS scripture, used code names for certain people and places. These names appear only in a few of the book’s sections, mainly those dealing with the United Order. It is believed that their purpose was to avoid the use of these sections in lawsuits by opponents of the Church, since giving the real names might have provided evidence that the United Order was legally a company, with its members financially liable for each other and the whole Order. Included in the revelation was the statement that “I will soften the hearts of the people, as I did the heart of Pharaoh, from time to time, until my servant Baurak Ale [Joseph Smith, Jun.] and Baneemy, whom I have appointed, shall have time to gather up the strength of my house, and to have sent wise men, to fulfill that which I have commanded concerning the purchasing of all the lands in Jackson County that can be purchased…for it is my will that these lands should be purchased; and…that my saints should possess them according to the laws of consecration which I have given [p.24] them. ” According to a letter Lyman Wight later wrote to Wilford Woodruff, Joseph Smith had “blessed and ordained” him “to the office of Baneemy” in Kirtland. The identification of “Baneemy” as “mine elders” was inserted by Orson Pratt in the 1876 edition of the Doctrine and Covenants, when the claims of Lyman Wight no longer seemed relevant. Originally the term appears to have been applied uniquely to Lyman Wight. Lyman believed he had received a specific calling to help lead the Saints to Jackson County at some later date. Being counseled to go to Kirtland and get his endowment, Elder Wight started in the fall of 1835, and preached his way through to Kirtland, baptizing such as would receive his testimony. While on the journey he called at the city of Richmond, Indiana, and gave out an appointment to preach in the court house. He walked through the city, and, being a stranger, was unknown; but wherever he went the people were blackguarding the “Mormons,” and many declared they would tar and feather the preacher when he came to meeting that night. At the time of appointment Elder Wight was at his post. There being no light provided, he went and bought candles and lighted the room. The house was soon filled with men who brought tar and feathers for the “Mormon” Elder. He preached about two hours, reproving them most severely for their meanness, wickedness and mobocratic spirit. whereupon a gentleman stepped forward and tendered him an invitation, which he willingly accepted. He was kindly entertained and furnished with money in the morning to aid him on his journey. He spent the winter of 1835-36 in Kirtland, and received his endowment. Settling near the Grand River in Daviess County, Missouri on about February 1, 1838, Lyman Wight built a house and later a ferry which became known as “Wight’s Ferry”. and used his home as the headquarters during his visit. It was from his house that Smith received revelation about Adam-ondi-Ahman and foretold the future gathering there. at a conference of local church members, Joseph Smith organized a stake at Adam-ondi-Ahman with John Smith, Joseph’s uncle as president, and Reynolds Calhoon and Lyman Wight as counselors. With the organization, members began settling in the area, including new members and refugees from Kirtland, Ohio. Wight had also become a Colonel in the 50th regiment of the Missouri Regiment, in the state militia, under the command of General H. G. Parks. By end of June, he was also head of the Danite organization in Daviess County. Between his several roles, Wight became the preeminent leader of the Latter Day Saints in Daviess. In the summer of 1838, the troubles of the Mormon War began with events on the Gallatin Election Day Battle. In response, Wight armed over 150 men at this time to defend the Latter Day Saints in Daviess. Lyman Wight was accused, along with Joseph Smith, of organizing an army and threatening and harassing various old settlers of Daviess County. Joseph and Lyman agreed to hold trial to ease the tensions in the area. On September 7, 1838, they were tried before Judge Austin A. King. The judge ordered them to stand trial before the circuit court on bail of $500. After the trial, emotions did not abate on either side. The Mormons and non-Mormons in Daviess engaged in non-fatal conflicts. Non-Mormon vigilantes from other counties came to Daviess and began to harass the Latter Day Saints in outlying areas, burning their homes and looting their property. Refugees began pouring into Adam-ondi-Ahman, seeking protection. The Mormon response was to call up armed volunteers from Caldwell County. Combining with the Daviess men, the Mormons split into three groups and raided the chief non-Mormon settlements. Wight led the raid on Millport. The old settlers and their families fled and Wight and his men looted their property and burned their homes to the ground (Baugh, pp. 86-87). While in custody of the state troops, Lyman endured the mockery and vulgarity of the troops, lying in the ground in the rain. A court martial which might have led to Wight’s execution was averted by General Alexander William Doniphan of Clay County who challenged the legality of any such court. Instead, Wight and the other leaders were tried in the civil courts. This was the true character of Lyman Wight: he was true as the sun to Joseph Smith, and would die for his friends. He was taken to Jackson county, with Joseph, Hyrum and other prisoners. They were chained together and fed on human flesh in prison by their Christian guards, and he continued to suffer with his brethren until April 15, 1839, when he started with Joseph and Hyrum Smith, Alex. McRae and Caleb Baldwin and guard, to go to jail in Columbia, Boone county, but on the night of the 16th, the sheriff fell asleep, the guard got drunk, and the prisoners left them, and went to their families and friends in Illinois. He replaced David W. Patten, who died in the Battle of Crooked River in 1838. His replacement of Patten was done without the knowledge or participation of Brigham Young and the other apostles while they were on their missions to foreign countries. In January, 1841, Elder Wight had been called by revelation to be one of the Nauvoo House Association. Wight and George Miller became co-responsible for a common-stock, religious cooperative company/church mill and logging town in the wilds of Wisconsin. Much lumber for the Nauvoo Temple and the Nauvoo House were floated down the Mississippi River from the several Mormon mills in the area. In 1842 he went to Kirtland, and rebaptized about two hundred of the cold, dead [inactive] members of the Church, and brought many of them to Nauvoo. In 1843 Lyman Wight returned from a nine month missionary tour. Cherishing these things in his heart, for to him these were the principles of “celestial law,” he went about his extensive missionary work with his fellow apostles throughout the years the church was at Nauvoo until the middle of June, 1843; upon returning from an eastern missionary tour of nine and one-half months, during which time he had traveled three thousand miles, baptized over six hundred persons, and organized twenty-one branches, he was asked to go to Wisconsin in company with Bishop George Miller to take charge of the sawmills there. These had been purchased by the church at a cost of twelve thousand dollars for the purpose of cutting timber and making shingles and sawing lumber for the building operations in Nauvoo, particularly the temple and Nauvoo House. Although Wight knew most of the members of the quorum of the Twelve quite well and had previously labored closely with Parley P Pratt and others, he was a late comer to the quorum and he did not seem to hold them in very high esteem. It should be remembered that Brigham Young and the other members of the quorum were called by Oliver Cowdery and David Whitmer. They were not designated as the “first Elders” or as the “first laborers of the last kingdom”. They had been warned that their callings as Apostles would not be complete until they saw Christ. There is no documented evidence to suggest any of them ever did see God and the Son. Lyman Wight, on the other hand, was called by Joseph Smith to the apostleship and he had been one of the first Elders of the Church. He was one of the first Elders of the church to see the Son of Man standing on the right hand of the Father and had been told by Joseph Smith that he was now qualified to be an Apostle. After the death of Joseph Smith, Wight felt compelled to follow the orders Joseph Smith had given him to found a safe haven for the Latter-day Saints in the Republic of Texas. Wight moved a group of Latter Day Saints there and eventually founded several communities on the central Texas frontier. The first Mormon temple west of the Mississippi was built at Zodiac, Texas, about three miles from Fredericksburg. Sealings, ordinations, washings, and anointings were performed in this temple by the Wightites. After several violent differences with President Young, during which time Wight’s plan for a mission to Texas could not be shaken, he took his family and those of his friends who would go, including nearly all the Black Falls Pine Company and went back to Prairie LaCrosse for the winter, as he found so many of his family and others sick of chills and fever in the “marshlands” of Illinois, after being used to the “pure waters of the pine country.” He thought it necessary for them to “regain their health” before starting on the trip westward. Brigham Young tried to get Wight to join the main body of Mormonism, The Church of Jesus Christ of Latter-day Saints, in Utah, several times, but Wight refused each time. Wight was eventually excommunicated in December 1848; his most prominent follower, Bishop George Miller, was also disfellowshipped. Like ALL of the other people of the restoration movement, including Sidney Rigdon, Wight became quite perplexed at what to do after the martyrdom. Wight later recognized William Smith as the President of the Church (Reorganized Church of Jesus Christ of Latter-day Saints) for a short time and served as a counselor in William’s short-lived First Presidency. After 1849, Wight wrote and stated that he believed the prophetic mantle of church leadership should fall on the shoulders of Joseph Smith’s sons. By then he had no use for Brigham Young, William Smith, and James Strang as pretenders, in his mind, as successors to Joseph Smith. In November 1851 Lyman Wight stated in a letter that the church had been rejected. As a pioneer in central Texas, Wight founded settlements in succession near Austin, at Zodiac (on the Perdenales), at Hamilton Springs, and near Bandera. Each settlement required building homes, setting up a mill, and hard, hard work. Brigham Young tried to encourage Wight to cast his lot with the Saints in Utah. On two different occasions, Young sent a pair of emissaries to Texas. Both teams returned with a report of Wight’s recalcitrance. Wight could not be budged. No use to talk to him. Despite his obstinate refusal to join them, Wight continued to be sustained as an apostle through1845, 1846, 1847, and most of 1848. In 1848, Wight became more outspoken in his opposition to his brethren, publishing a pamphlet entitled An Address by Way of an Abridged Account and Journal of My Life. When the pamphlet reached Utah in December, Wight was almost immediately dropped from the Twelve and excommunicated from the Church. He had made his choice. Even then, some of his former associates continued to hope he would see the light and rejoin them. Nathan Porter and Wilford Woodruff were two who wrote him long, patient letters, reasoning with him, assuring him of the warm welcome he would receive. No doubt other letters reached Wight that we know not of. He died with a small remnant of his colony on March 31, 1858, a few miles from San Antonio. Wight’s group had been trekking for Jackson County, Missouri, where he wished to rejoin the remainder of the Mid-Western Saints. He was buried at the Mormon cemetery at Zodiac, which no longer exists. The only remaining material infrastructure of the colony is the cemetery near Hamilton Creek in Burnet County, about fifty miles east by north of Fredericksburg. On March 25, 1845, Wight and about 150 followers, in four homemade boats, started down the Mississippi River for Texas (Table 1). They began their overland journey near Davenport, Iowa. They suffered Indian problems, disease, and death throughout their journey. On November 10, 1845, the train of eight wagons and 82 cattle crossed the Red River at Preston Bend into Texas after traveling more that 850 miles in 165 days. Their first settlement in Texas was the old Fort Johnson in Grayson County. They stayed there about ten months and, in the spring, moved on south to Austin arriving June 6, 1846. At the falls of the Colorado River, the location of today’s Mormon Springs, the Colony built their first gristmill. They built the city jail and worked as carpenters and millers. Unfortunately the spring dried up and the mill, though intact, became inoperative. Wight requested permission from the Adelsverein, or German Society, to establish a colony on Grape Creek, twelve miles east of Fredricksburg. The creek dried up so the group selected a location seven miles nearer Fredricksburg on the Pedernales River. Within six weeks the grist mill was completed and the community housing was under construction. The Mormons, with their gristmill, sawmill and experience in lumbering and construction were a godsend to the German emigrants. It was the Mormons who introduced corn and other varieties of grain to the starving Prussian. The community pride and joy became the grist mill with its huge revolving water wheel and the special French buhrs (grinding stones) made it possible to have ground cornmeal and flour with minimum effort. Today, a replica of the Mormon millwheel stands in downtown Fredricksburg. Sometime after the community was established, Lyman Wight gave it the name Zodiac. There was no written explanation for this name. Zodiac was composed of well-built houses, perfect fences and tidy dooryards. They had a blacksmith, a turning lathe, a wagon shop, a general store, a shingle mill, a Temple-storehouse, cabinet and furniture shops, and a two story community building that served as a meeting hall, a Temple and a school for the children. The Mormons lived congenially with their German neighbors. The Saints were well respected for their business dealings, for their industry and high values. For the first time there were no persecutions. The 1850 census recorded 160 residents living on 2,217 acres of land with nearly $26,000 worth of improvements. But once again, hard times hit the brave little group. In 1850, floods destroyed their mills. This was an economic blow to them and the community. As they were recovering from the flood, another flood hit and washed the mill stones away. This seemed like the end of the world. The Saints, nevertheless, were resilient. An exploration party of Stephen Curtis, Meachum Curtis, Ezra A. Chipman, Joseph Goodale and Orange Wight were sent out to find a new location for the colony. They soon reported that they had found a location near Marble Falls on Hamilton Creek. Thus, the group moved on to Hamilton Creek in Burnet County in 1851. Once again, they set up mills and shops. They had lost their grinding buhrs in the flood at Zodiac. They had no money to buy new buhrs so they went to a nearby quarry and obtained stone from which to make replacements. Lyman Wight, however had a vision of where the lost stones were in Zodiac. A group of men took spades and shovels and set out to locate the stones. They found the stones, as Lyman Wight said they would, in the middle of a sandbar deposited by the flood. Now that they had the grinding stones, they could increase their milling activities, add a sawmill and a lathe with which they manufactured chairs and tables. They also operated a farm. The women made willow baskets for sale. Despite the successes, they were in debt and were plagued by Indian raids. Disease killed at least 23 members of the Colony. By the fall of 1853 the Wight Colony was once again looking for a home. Because they had also become herdsmen, they required about six months to herd their cattle to Bandera. They arrived in Bandera in the spring of 1854. At first in Bandera, they camped on the north bank of the Medina River across from the town. Eventually they bought lots in town, built a schoolhouse and a furniture factory. Wight performed the first marriage in Bandera County, wedding his son Levi Lamoni Wight and Sophia Leyland. They settled in to raise their children. Jessie Hay, widow of Alexander Hay, was the first woman to receive real property in Bandera. When she died she left an estate of 320 acres of land, lots 15 and 16 in Bandera and 80 head of cattle plus the house and household goods. The Saints, established as taxpayers, decided to expand and incorporate a farm into their enterprise. The best land for this purpose was located downstream on the Medina River, about twelve miles from Bandera City, but still in Bandera County. The farm land was leased and during 1854-5 some of the group moved to the farm site to prepare for the spring planting. About sixteen families moved to Mountain Valley (called Mormon Camp by many) but the pioneers suffered from the Indian depredations. Raiding Comanches stole their horses and mules, burned their crops and drove off the cattle. When Medina Lake was complete in 1912, the lake forever submerged Mountain Valley, the sight of the last organized home of the Lyman Wight Colony. In March of 1858, Wight announced that he had a vision of God warning him about the coming war between the North and the South. Moreover, God warned him to move back to the North. Wight announced his plans to move, but his plan to go north was met with a great deal of opposition. Even three of his sons refused to go. Those who chose to follow left with Lyman Wight. But only 2 days into the thousand-mile journey, Wight suddenly became ill and died on March 31, 1858, in the camp on the Medio River (today the location of Lackland Air Force Base). Lyman Wight was buried at Zodiac alongside his daughter Rosina Minerva and other Saints including William Eldridge, William Leyland, Sophia Leyland, and many others and the infants who died at Zodiac. Following his death, the expedition fell apart. Many of the faithful affiliated with the Reorganized Church of Jesus Christ of Latter Day Saints which had established its headquarters in Independence, Missouri, back in the Zion of Joseph Smith. Looking back, the Saints were instrumental in the formation of three counties in Texas: Gillespie 1847-8 and then Burnet County in 1851-2, and finally, Bandera County in 1856. The history of the Lyman Wight Colony is no doubt inseparable from the history of Texas and the United States. The Saints have left a notable mark in opening the west (Table 3) to other pioneers. Finally, the Frontier Times Museum in Bandera, Texas, houses one of the millstones, a hand made chair and other memorabilia from the Colony. Fearless, honest, unassuming, and absolutely independent, Lyman Wight called no man his master save one, Joseph Smith, his great friend, and to him alone he had looked for guidance. Even from him, he differed occasionally and took no pains to conceal it. “I would rather go to hell of my own accord than be forced into heaven,” he was wont characteristically to say. Curiously, in a movement where the majority of group leaders met violent opposition, Lyman Wight, to whom the applause of the world meant nothing, never lacked for it, and that too, in spite of social anachronisms that were blamed for the unpopularity of other factions. Contemptuous of individual wealth, Lyman Wight’s communal experiment flourished financially, in spite of frequent transplantings due to his restless leadership. Lyman Wight never claimed the right to lead this colony as a divinely appointed head. Praise the Lord God of Israel for Lyman Wight. He shall return. This entry was posted on Sunday, June 7th, 2009 at 1:15 pm and is filed under Uncategorized. You can follow any responses to this entry through the RSS 2.0 feed. You can leave a response, or trackback from your own site. Thank you so much for high lighting the life and calling of Lyman Wight. I too find myself looking forward to meeting and embracing this great man. I just read the article in the meridian magazine and he has the direct opposite feelings about Lyman Wight that you and I just expressed. I was way disappointed in the author when he tarnished Lyman’s reputation by suggesting that maybe he didn’t follow Brigham to Utah due to an addiction to opium. So interesting that a man we revere he pities. I too was very disappointed that he approached the topic the way he did… It was a new and innovative approach of doing character assassination. What a rich article, Watcher. I must confess I knew relatively little of brother Lyman before this post. Interestingly, a friend of mine (who happened to be my previous boss a few months ago at D. Univ.) is married to a descendant of Lyman Wight. My friend has recently gone through a spiritual re-birth whereupon he has become “active” in the church (we had a tremendous discussion about your article “be ye…perfect” one day in his office)–I even use a little sleight of hand to introduce some of the three watches doctrine! His wife, unfortunately, is pretty cold to LDS doctrine in general. In fact, she’s an official of some sort in her Presbyterian denomination. She’s not above, however, coming over with my friend to enjoy a home-cooked meal prepared by my beautiful wife! I’m sure he’ll enjoy some of the material from this post. I must confess also that with all of the research I have done in LDS History Wight was really not on my radar. Special thanks to CDS for turning my thoughts to Wights comments about the church being rejected with their dead… that got me researching his life much more carefully than I have in the past and all of a sudden amazing things began to pop up. It never fails to amaze me how many wonderful, colorful, passionate, spiritual people were attracted to the gospel light and the sacrifices they made for the kingdom! AMAZING! I love this kind of stuff. Thanks Watcher and CDS. Thank you for the material on Lyman Wight. I never knew much about him. I believe that he had been part of one or more of the extra-Church organizations and may have received his 2nd anointings authorizing him to build up the kingdom wherever he wished. If he in fact had received his 2nd anointings, I wonder at the appropriateness of the excommunication. “Baneemy” appears to be an Old English (beneme) and Irish Gaelic (bainimdh) word meaning “to deprive of”, “to take away from”, “to remove”, or “to cut or strip off”. That definition makes a lot of sense.. although I question your application. Yes, that is one way to interpret the information you have found… that Lyman will be “cut off”. The other way to interpret it, which in my humble opinion has much more scriptural support and is more consistent with his life and ministry, is that he, as a warrior of the Lord, will be doing the cutting off, during the 3rd watch. “I will soften the hearts of the people, as I did the heart of Pharaoh, from time to time, until my servant Baurak Ale [Joseph Smith, Jun.] and Baneemy, [Lyman Wight] whom I have appointed, shall have time to gather up the strength of my house, and to have sent wise men, to fulfill that which I have commanded concerning the purchasing of all the lands in Jackson County that can be purchased…for it is my will that these lands should be purchased; and…that my saints should possess them according to the laws of consecration which I have given [p.24] them. Clearly, the above prophetic passages did not refer to the failed attempt to redeem Zion back in the 2nd watch. They will verily come to pass just as the Lord hath said. Lyman works in concert with Joseph during the 3rd watch to redeem Zion. According to the parable Joseph, Lyman and others will be “taking away” ,the land from the wicked who encumber it, and will “remove” them from it.. I guess it can be seen two different ways. Thank you for providing the great definition, I think it speaks as favorably for Brother Lyman as you appear to think it condemns him. I guess we can both chat with him about it and get his view on it when he returns. I don’t know my Irish grammar well enough to tell you what the aspirated “dh” (y) at the end of the root word “bainim” means. Joseph Smith, Jr., had a habit of using Gaelic terms in his revelations, which is telling has he is descended from the bardic cast and ecclesiastical princes of Ireland, the ancient M’Gowan family (to which I am related through the House of Ir, Clan King, and our common patriarch Conal Cearnach). For example, Master Mahan: Mahan is a Gaelic term meaning “wild beast of the field”. Mahan comes from Mathghabhuin — “magh”: Irish, a plain; “gabhuin”: a calf — “‘the bear of the plain’ or ‘a wild calf’; for a bear is strictly a kind of wild calf”. 16 And Cain said, Truly I am Mahan, the master of this great secret, that I may murder and get gain. Wherefore Cain was called Master Mahan; and he gloried in his wickedness. 17 And Cain went into the field, and Cain talked with Abel his brother; and it came to pass, that while they were in the field, Cain rose up against Abel his brother, and slew him. PS: I am not saying who was to be cut off, Joseph or Lyman. I was merely defining a word. I refuse to speculate as to who is or isn’t cut off in this matter. Derek thanks for sharing what you found! I found your site when I was browsing for something unrelated, but this post was on the first page of Yahoo your blog must be incredibly popular! Keep up the good work! It would be great to hear about others of the first elders. I was reading backwards in the D&C, from 42 going backward, and I started getting into all the blessings that were given to many of these first elders. I have always been bored when reading these blessings before, and I have wondered why thy are in the D&C. This time I saw that these elders were most likely part of the group that received or would receive the calling of “high Priest”, that would be dispensed beginning at the Morley Farm. It would be great if posts were written on these men like this one was on Lyman Wight. And it would be good to have them in a group, so we don’t have to go searching for them in different places. I’m going to read this one in family night tonight. I would suspect Joseph Smith III Israel Smith and Frederick Smith William Marks and their associates will also have a great part to place in the coming work. Nonetheless, it is certainly possible they will be involved. I have a request if it’s not too much trouble. 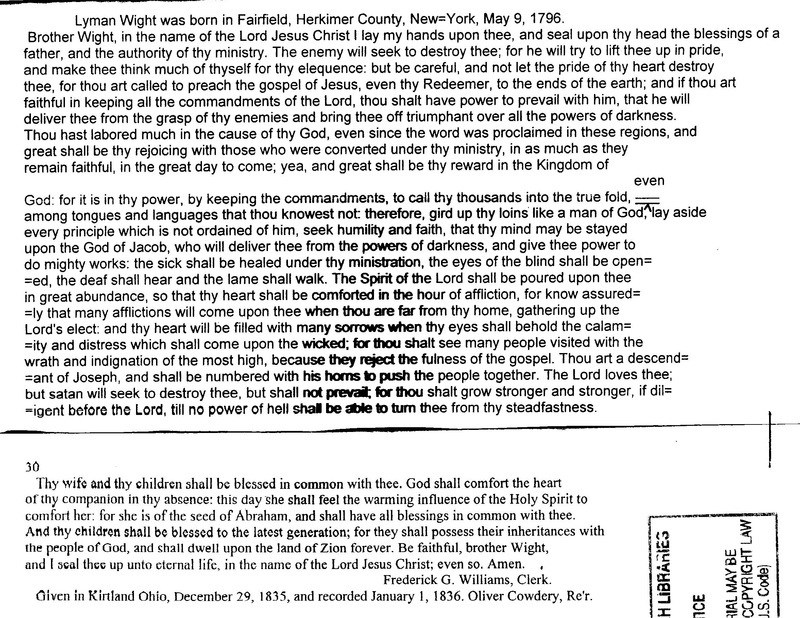 Could you post the patriarchal blessing for Lyman Wight on the site, or any others that you feel would be helpful? I’ve searched online and can’t find his blessing. Thanks! I have never seen the blessing for Lyman Wight. I think it would be fun to read it. I just did a search and it appears that the special collections area in the J. Willard Marriott Library at the U of U does have a copy. I suspect that one would need to physically visit the special collections department to get to view it. Next time I am in the area, which will not be any time soon, I will check into it. If you live close to the U you might want to check it out. I’m looking forward to it. I appreciate it! Lyman Wight is my 5th Great Grand Uncle. I never knew of this relationship until I was living in Austin and saw a monument on Mount Bonnell that referenced him and the colony there. That got me looking into my own Wight ancestors and found the connection. I’ve since grown to love him. He was in Liberty Jail with Joseph Smith. I also found a story where Joseph came to visit him at Adam-Ondi-Ahman and they were all in low spirits so Joseph organized a massive snowball fight. Great souls I hope to be able to hang with some day! It is fun to hear of the human-ness and humor that these great souls had in the midst of the amazingly sober things they had to go through. I to, long to hang out with them some day. What does it mean to “be numbered with his horns”? Is this a prophetic utterance pointing toward a future work? A work where he will behold the wrath of God and his indignation and clalmity upon those that reject the fullness of the gospel? Horn is a symbol of power, right? Also his descendents shall be blessed and have an inheritance with God’s people and dwell in Zion forever. Has anyone done research I to what happened to his posterity?